Product code: ES7476 Categories: Art Deco, Art Deco Rings & Art Deco Engagement Rings. When the Art Deco period and French jewellers came together, this resulted in some spectacular rings being made, such as this platinum French Art Deco diamond engagement ring dating from the 1920’s. Art Deco rings have never gone out of fashion or style, and when you look at the beautiful design of this one it is so easy to see why. Hand made in platinum, this was the metal of choice during the Art Deco period as it is the purest of all the precious metals used in jewellery and also allows for fine intricate work to be done all the while securely holding the diamonds in place. The design and elegance of this ring both come together so well making this Art Deco ring one that will continually be loved and admired every time that it is worn. 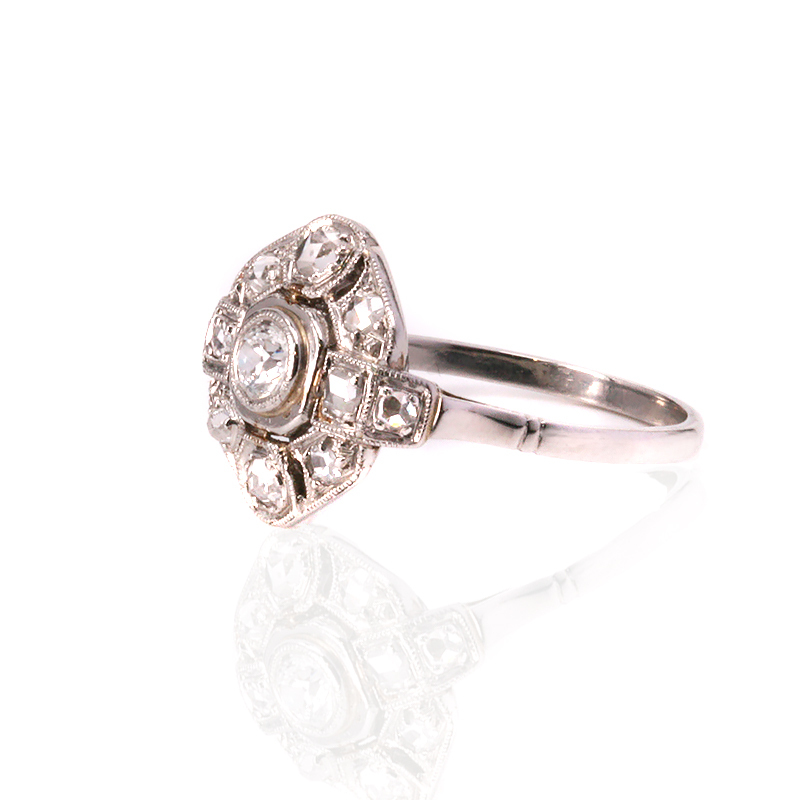 Platinum French Art Deco diamond engagement ring. 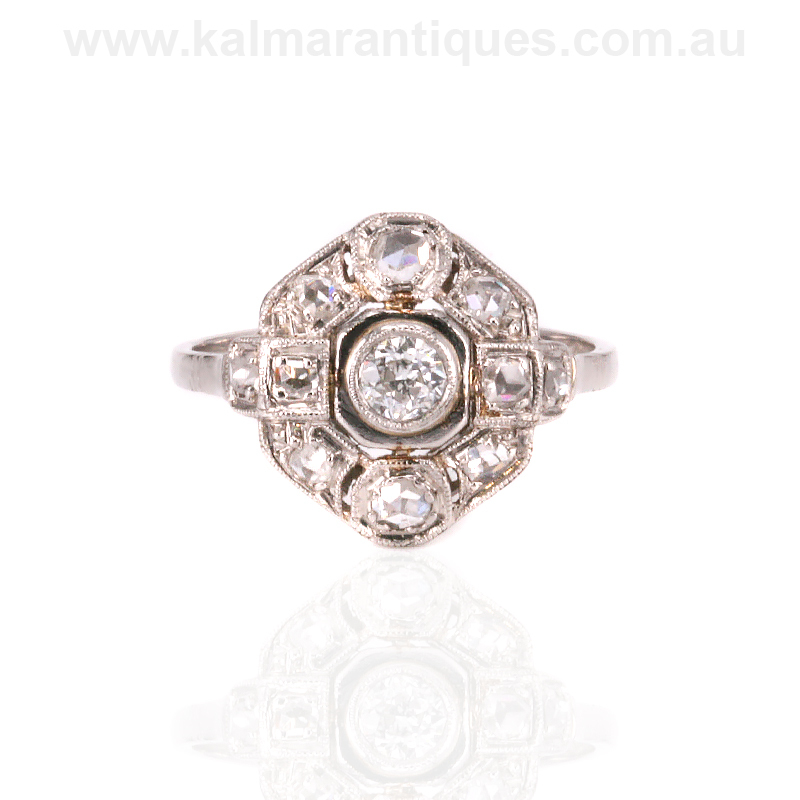 Stunning hand made diamond engagement ring from the fabulous Art Deco era of the 1920’s. Art Deco rings of the 1920’s to the 1940’s has remained as popular today as when they were first made and are the most popular era for engagement rings. While many modern rings try to replicate rings of this era, there is nothing quite like a genuine Art Deco diamond engagement ring on your finger that is truly a one off. Set with a combination of early rose cut diamonds, which were one of the first cuts of diamonds, surrounding the more “modern” semi-modern cut diamond, the ring was hand made in platinum which is the purest of all the precious metals used in jewellery making. Platinum has the ability to be drawn into a fine wire and still have the strength to securely hold the diamonds in place.